President Donald Trump tweeted on April 14 about the Syrian airstrikes. 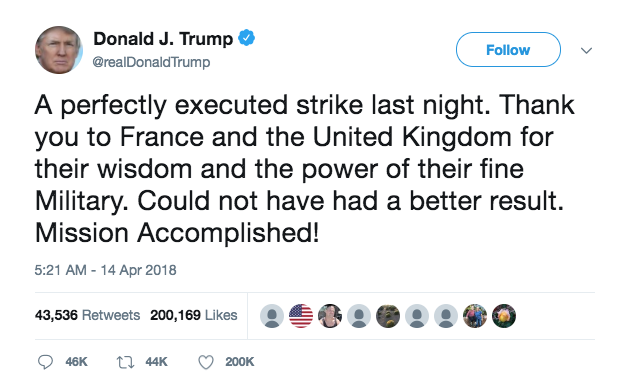 On April 14, President Trump tweeted about how a “perfectly executed strike” occurred the night before in Syria. This strike was done in response to a chemical attack that Syrian President Bashar al-Assad committed against his citizens earlier. Done in collaboration with the United Kingdom and France, the 105 missiles fired targeted three facilities responsible for building chemical weapons. Whatever legitimate political reasons there are for this attack, it can only be more harmful than beneficial in the long run. One concern for this strike is the economic cost. Sixty-six Tomahawk cruise missiles were launched by the United States. These missiles alone cost $92.4 million. The United States has built a reputation for spending more than any other country on our military. Sometimes there are justifications for this kind of spending, but this seems fiscally irresponsible considering the potential consequences. More important than the economic costs are the political ones. I cannot see the outcome of this being more beneficial than harmful. Assad can only become more infuriated at our actions as a result of these bombings. It also does not help that Syria and Russia are allies. An event such as this only strengthens the tension between the United States and Russia. This escalation will most likely result in more funding for the Syrian government by Russia, leading to even more involvement in the war in Syria. And what exactly are we still fighting in Syria for? It’s almost as if we have not learned anything from our past interventions; that intervening in conflicts in such a manner only makes them worse. Yes, there are legitimate reasons to intervene concerning human rights and the brutality of the Assad regime, but who deals with the consequences of both Assad’s disregard for human rights as well as our intervention? The civilians of Syria, who are entangled in a civil war that has practically destroyed their country. Seventy people were killed in the most recent chemical attack which we bombed Syria for. We will face certain political consequences, but nothing like what the civilians of Syria have dealt with and will continue to deal with. I wouldn’t necessarily disagree with intervention on the basis of protecting human rights. The way in which we have gone about it is what I would disagree with. Our retaliation towards the Syrian government will lead to more of the same. The time where intervention may have been justified in this conflict is long gone. It is wrong to claim “mission accomplished,” like our president has when the goal isn’t clear to all Americans. We cannot expect ourselves or our allies to fix this, especially in the way we have gone about doing so.